Friday, the 12th of November, 1652. Mr. Nevill, Tellers for the Yeas: 28. Sir Arthure Hesilrig, Tellers for the Noes: 49. The House, according to former Order, took into Consideration the Nomination of Sheriffs for the several Counties. Resolved, by the Parliament, That John Huxlie Esquire be nominated and appointed Sheriff of the County of Bedford, for the Year ensuing; and that the Lords Commissioners for the Great Seal of England do issue forth a Commission to him, to be Sheriff of the said County, accordingly. The like Order for John Lawrance, Esquire, to be Sheriff of the County of Bucks. 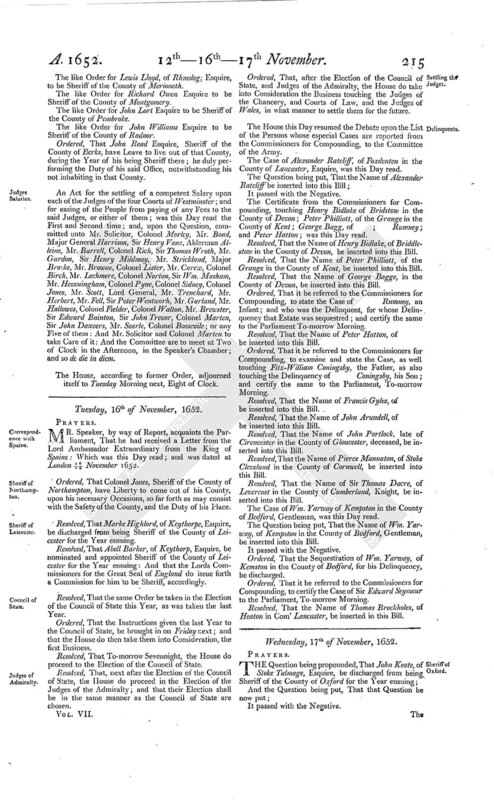 The like Order for Levinus Bennett, Esquire, to be Sheriff of the Counties of Cambridg and Hunt'. The like Order for Peter Dutton, of Hatton, Esquire, to be Sheriff of the County of Chester. The like Order for Richard Treville, of Ninio, Esquire, to be Sheriff of the County of Cornwall. The like Order for Myles Halton Esquire to be Sheriff of the County of Cumberland. The like Order for George Sitwell Esquire to be Sheriff of the County of Derby. The like Order for George Southcott, of Buckland, Esquire, to be Sheriff of the County of Devon. The like Order for John Turberfeild, of Beere, Esquire, to be Sheriff of the County of Dorsett. The like Order for Francis Wren, of North Aukland, Esquire, to be Sheriff of the County of Durham. The like Order for John Rean Esquire to be Sheriff of the County of Berks. 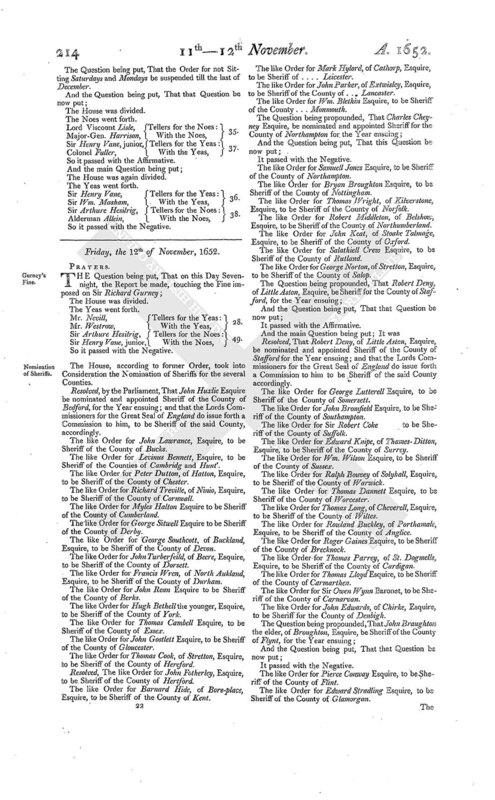 The like Order for Hugh Bethell the younger, Esquire, to be Sheriff of the County of York. The like Order for Thomas Cambell Esquire, to be Sheriff of the County of Essex. The like Order for John Gostlett Esquire, to be Sheriff of the County of Gloucester. The like Order for Thomas Cook, of Stretton, Esquire, to be Sheriff of the County of Hereford. Resolved, The like Order for John Fotherley, Esquire, to be Sheriff of the County of Hertford. The like Order for Barnard Hide, of Bore-place, Esquire, to be Sheriff of the County of Kent. The like Order for Mark Hylord, of Cathorp, Esquire, to be Sheriff of . . . . Leicester. The like Order for John Parker, of Extwisley, Esquire, to be Sheriff of the County of . . . Lancaster. The like Order for Wm. Blethin Esquire, to be Sheriff of the County . . . Monmouth. The like Order for Samuell Jones Esquire, to be Sheriff of the County of Northampton. The like Order for Bryan Broughton Esquire, to be Sheriff of the County of Nottingham. The like Order for Thomas Wright, of Kilverstone, Esquire, to be Sheriff of the County of Norfolk. The like Order for Robert Middleton, of Belshow, Esquire, to be Sheriff of the County of Northumberland. The like Order for John Keat, of Stoake Talmage, Esquire, to be Sheriff of the County of Oxford. The like Order for Salathiell Crew Esquire, to be Sheriff of the County of Rutland. The like Order for George Norton, of Stretton, Esquire, to be Sheriff of the County of Salop. It passed with the Affirmative. Resolved, That Robert Deny, of Little Aston, Esquire, be nominated and appointed Sheriff of the County of Stafford for the Year ensuing; and that the Lords Commissioners for the Great Seal of England do issue forth a Commission to him to be Sheriff of the said County accordingly. The like Order for George Lutterell Esquire, to be Sheriff of the County of Somersett. The like Order for John Bromfield Esquire, to be Sheriff of the County of Southampton. The like Order for Sir Robert Coke to be Sheriff of the County of Suffolk. The like Order for Edward Knipe, of Thames-Ditton, Esquire, to be Sheriff of the County of Surrey. The like Order for Wm. Wilson Esquire, to be Sheriff of the County of Sussex. The like Order for Ralph Bouvey of Solyhall, Esquire, to be Sheriff of the County of Warwick. The like Order for Thomas Dannett Esquire, to be Sheriff of the County of Worcester. The like Order for Thomas Long, of Cheverell, Esquire, to be Sheriff of the County of Wiltes. The like Order for Rowland Buckley, of Porthamale, Esquire, to be Sheriff of the County of Anglice. The like Order for Roger Gaines Esquire, to be Sheriff of the County of Brecknock. The like Order for Thomas Parrey, of St. Dogmells, Esquire, to be Sheriff of the County of Cardigan. The like Order for Thomas Lloyd Esquire, to be Sheriff of the County of Carmarthen. The like Order for Sir Owen Wynn Baronet, to be Sheriff of the County of Carnarvan. The like Order for John Edwards, of Chirke, Esquire, to be Sheriff for the County of Denbigh. The like Order for Pierce Conway Esquire, to be Sheriff of the County of Flint. The like Order for Edward Stradling Esquire, to be Sheriff of the County of Glamorgan. The like Order for Lewis Lloyd, of Rhnedog; Esquire, to be Sheriff of the County of Merioneth. The like Order for Richard Owen Esquire to be Sheriff of the County of Montgomery. The like Order for John Lort Esquire to be Sheriff of the County of Pembroke. The like Order for John Williams Esquire to be Sheriff of the County of Radnor. Ordered, That John Read Esquire, Sheriff of the County of Berks, have Leave to live out of that County, during the Year of his being Sheriff there; he duly performing the Duty of his said Office, notwithstanding his not inhabiting in that County. An Act for the settling of a competent Salary upon each of the Judges of the four Courts of Westminster; and for easing of the People from paying of any Fees to the said Judges, or either of them; was this Day read the First and Second time; and, upon the Question, committed unto Mr. Solicitor, Colonel Morley, Mr. Bond, Major General Harrison, Sir Henry Vane, Alderman Alleine, Mr. Burrell, Colonel Rich, Sir Thomas Wroth, Mr. Gurdon, Sir Henry Mildmay, Mr. Strickland, Major Brocke, Mr. Browne, Colonel Lister, Mr. Carew, Colonel Birch, Mr. Lechmere, Colonel Norton, Sir Wm. Masham, Mr. Heveningham, Colonel Pyne, Colonel Sidney, Colonel Jones, Mr. Scott, Lord General, Mr. Trenchard, Mr. Herbert, Mr. Fell, Sir Peter Wentworh, Mr. Garland, Mr. Hallowes, Colonel Fielder, Colonel Walton, Mr. Brewster, Sir Edward Bainton, Sir John Trevor, Colonel Marten, Sir John Danvers, Mr. Searle, Colonel Bossevile; or any Five of them: And Mr. Solicitor and Colonel Marten to take Care of it: And the Committee are to meet at Two of Clock in the Afternoon, in the Speaker's Chamber; and so de die in diem.